With the F-TYPE Jaguar intends to offer a full range of models in order to broaden the appeal of its sports cars. "While developing the initial V6- and V8-engined automatic-transmission convertibles, Jaguar has considered all possible options - a coupe, ultra-high-performance R-S versions, manuals, diesels and hybrids, small-capacity engines and even four-wheel drive." Said Jaguar global brand director Adrian Hallmark. The most likely extension to the line-up is a coupe. The original concept car - the Jaguar CX-16, revealed at the Frankfurt show in 2011 ­- had a hardtop. It would also fit with Jaguar's plans to make the F-TYPE a rival for the world's best-selling sports car, the Porsche 911. "The reason we did the roadster first is that it is the most complicated and provided us with the biggest challenges," says Hallmark. "At this level the market for coupes and convertibles is split roughly 50:50, but convertibles command a price premium in return for being harder to engineer. Now all the hard work is done. The foundations are there." Jaguar recently introduced four-wheel-drive versions of the XF and XJ saloons in markets prone to extreme weather or plagued by poor roads, and the F-TYPE is capable of accommodating all-wheel-drive if the demand is there, says Halmark. 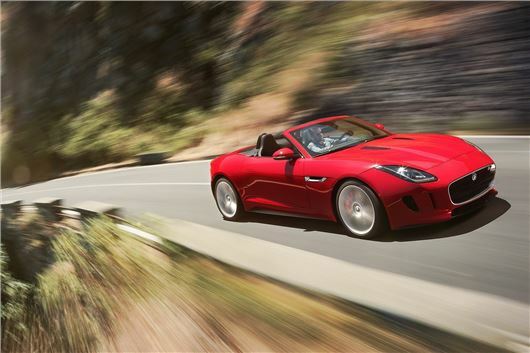 "The V6 engine was developed with all-wheel drive in mind and the F-TYPE is 4WD-capable," says Hallmark. The restricting factor with any all-wheel-drive car, he adds, is the shape and size of the engine and whether it is possible to add the additional components needed to take drive to the front wheels. "The main purpose of four-wheel drive is to increase traction with high-power engines," says Hallmark. He feels that the 490bhp of the range-topping F-TYPE V8 S is "the limit of two-wheel drive in a controllable way" in the car, but says that it is not technically feasible to offer 4WD with the V8 engine. That suggests that if there is to be an R-S model with more than 500bhp it would be a variant of the V6. "But I drove a V6 S (the mid-range 375bhp version) 3,500 kilometres in the snow and ice in January, up mountains in Austria and then on to France," Hallmark says. "With snow tyres and the transmission in winter mode, four-wheel drive isn't necessary. I understand it's a peace-of-mind thing and we've thought about it, but it's not confirmed." Hallmark also says that hybrids and diesels are "not a priority" for the F-TYPE. Jaguar Land Rover group has developed a hybrid powertrain for the new Range Rover, but, says Hallmark, if it was offered on the sports car "there would be no boot space left and it would add 400 kilos". Full Road Test and Video of Jaguar F-TYPE V6, V6S and V8S on this website from 17-4-2013.